From the inflammatory myth-building of 1991's You Love Us to 2010's reflectively titled Postcards From A Young Man, the Manic Street Preachers have always conducted a dialogue with their own reputation, looking back in order to move forward. Some albums have worked better than others but each one has had something new and necessary to say. So the back catalogue explorer can follow them on a fascinating path from small-town provocateurs via arena-rock stars to the elder statesmen summed up in the title of new singles collection National Treasures. The hungry lyrical intelligence of Nicky Wire and the late Richey Edwards has always been matched by the musical voracity of James Dean Bradfield and Sean Moore. Few bands can claim, at different points, to have sounded like Guns N' Roses and Depeche Mode; PiL and Rush; Queen and Magazine. Such a diverse creative journey was as impossible to foresee back in 1989 as it is remarkable to reflect on now. An unignorable edge-of-the-abyss masterpiece, The Holy Bible is monstrously heavy in both sound and outlook. The relentless, painful self-interrogation may be Richey Edwards's, but it's the band's telepathic intimacy that makes it blaze with life. Victory, defeat, survival: these are the themes which inform the Manics' enforced reinvention as a trio, with Nicky Wire flowering as a lyricist. huge (it went double platinum), it's a mainstream rock record of rare humanity and intelligence. Sandwiched between the return-to-rock anthemicism of Send Away The Tigers and Postcards From A Young Man, this fierce, poignant reclamation of Edwards's final lyrics is the Holy Bible sequel that never was. They famously promised they'd sell 6 million copies of their first album and then split up: rhetoric as giddy and provocative as the music itself. Erratic, overblown, brimful with ideas, and crazed with youthful self-belief. Debut as declaration of war. Their commercial zenith is an oddly depressive record, powered by irresistible singles but slowed down by too much mid-tempo introspection. Featuring Nye Bevan, Richard Burton and the flooded village of Capel Celyn, it's their most Welsh album. A fractious, chaotic repudiation of success and its temptations (the enemy, they explained, was the band they had become), Wildcard musical eclecticism verging on nervous breakdown. Sometimes misguided, often spine-tingling, never dull. 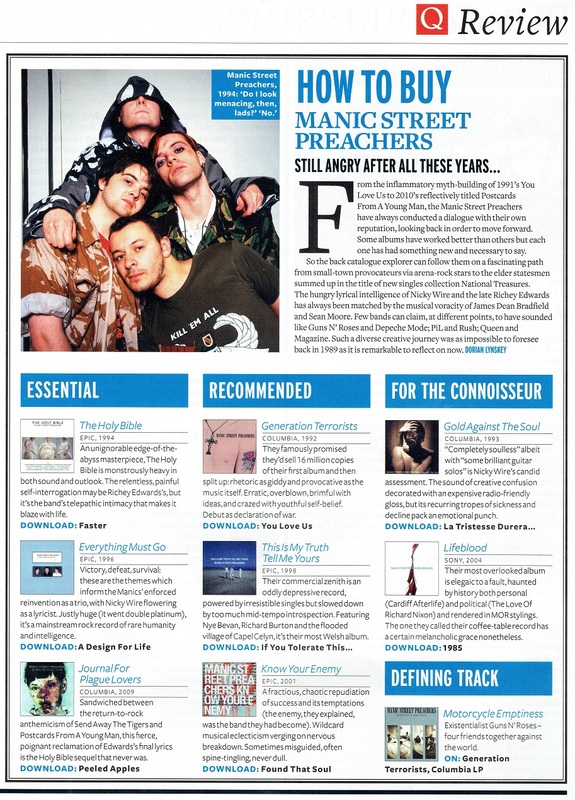 "Completely soulless" albeit with "some brilliant guitar solos" is Nicky Wire's candid assessment. The sound of creative confusion decorated with an radio-friendly gloss, but its recurring tropes Of sickness and decline pack an emotional punch. Their mast overlooked album is elegaic to a fault, haunted by history both personal (Cardiff Afterlife) and political (The Love Of Richard Nixon) and rendered in MOR stylings. The one they called their coffee-table record has a certain melancholic grace nonetheless. Existentialist Guns N' Roses- four friends together against the world. This page was last modified on 1 October 2018, at 17:39.